In order to provide you with all our data and with the greatest possible transparency, Ceram team performs a statistical analysis of all our treatments year after year. When interpreting the results we must take into consideration that each case and couple are different. Because of this reason we must find a way to maximize the chances of pregnancy in every particular case. 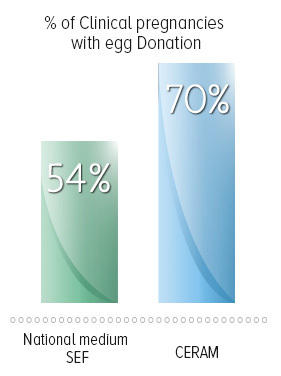 The results on the right hand side show the clinical pregnancy rates of the egg donation treatments performed during the first quarter of 2014 at Ceram in comparison to the national average. 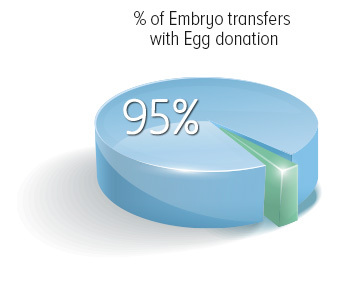 Another important aspect about our latest statistics is that in 95% of the egg donation cases, the embryos reach the transfer phase at Ceram. Why does Ceram obtain higher results than the national average? More than 20 years of experience dedicated to assisted reproduction. Constant studies and integration of the latest technologies. Careful study of each couple and election of treatment which maximizes the possibilities of pregnancy in every case. Dr Benito performs a very simple yet important test to determine before recommending a treatment with own eggs or donor treatment.